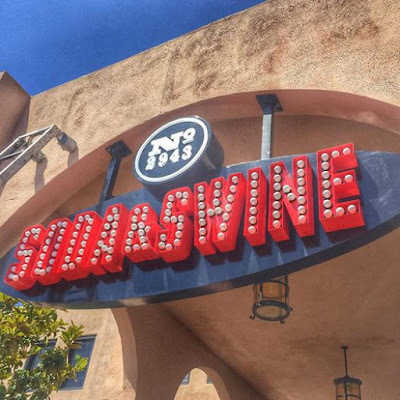 On Monday afternoon we headed to Soda & Swine in Liberty Station to celebrate Greg's birthday. I've been wanting to go there for a few months since I saw the coming soon sign and it did not disappoint. The decor was very rustic with lots of wood and some modern touches of steel. It had a very casual vibe and there were a ton of families there. It was an open space with lots of natural light and a cool breeze blowing through the restaurant because of the many open areas. They even had a super long foosball table with glass on top. You can slide the glass back and forth to make it a table to eat on. Such a cool touch! You walk up to the counter to order and the seating is open. We first sat at the foosball table but moved to the bar to make room for a large party. When you order you can choose an item from the favorites section or build your own by choosing the type of meat, sauce, cheese, and then what you want it served on. You have a choice of a slider, submarine, skillet of three, or with spaghetti. They also have a list of sides and they ALL sounded amazing. I got the Swine slider (smoked pork with chipotle BBQ sauce and pepper jack cheese) and the Bovine slider (beef with marinara and mozzarella). Mark got the Bovine submarine and we shared the Fried Pizza Knots. The meatballs were tender and juicy and the sauces were both perfect. I think the Bovine was my favorite because the mozzarella and the marinara sauce are just so classic and delicious. The pizza knots were the right amount of crunchy and salty... perfection. Greg ordered a similar submarine to my first slider but he ordered it with feta cheese. He loved his as well. He got the roasted brussels sprouts as a side and we all had a little taste. They were so yummy! The bacon and the fish sauce gave it a real smoky and intense flavor. They had fresh baked pies with soft serve but we were too stuffed to eat dessert there, but next time for sure! We loved Soda & Swine and we plan on bringing my parents there this weekend! Check it out if your in the Point Loma area.